The headline co-ordinates will take you to the entrance of the Chapel, where information will need to be collected to take you to the final. This will be a small disguised container. Ample parking at parking waypoint below. This is the last remaining Thatched Chapel in Cornwall and probably the only one remaining in Britain today. There were Methodists in Gwithian before 1767, and in 1771 they built a small chapel on a plot at Nanterrow Lane. 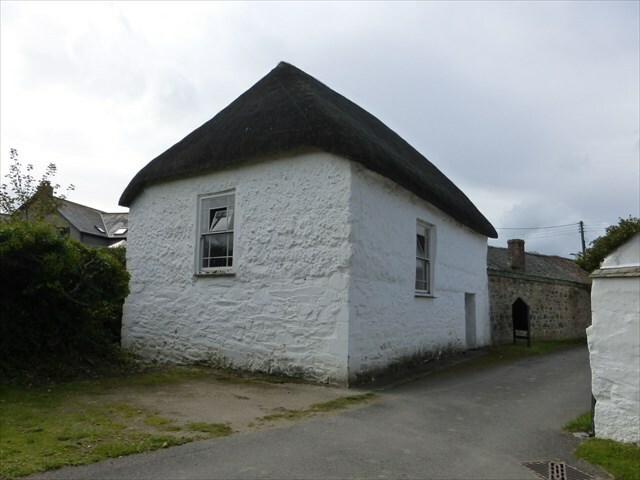 By the early 1800s a larger meeting house was needed in the village, so some land was leased from a Mr Richard Hockin - gent - of Churchtown Farm. The plot of land leased was just 34 feet long by 25 feet wide. The lease, at a token rent, was for 999 years, though in recent years it was changed to freehold. The Chapel only just fits on this plot, being 34'x24' externally. The walls of the Chapel are stone to head height and cob above that, up to a thatched roof. The roof thatch needed replacing in 1969 and part of the funding came from the BBC's "The Week's Good Cause"
In 1996 the Chapel was given Grade ll status on the grounds that " It is now unique, the last externally complete example of this type of early Methodist meeting house". In 1999, its status was upgraded to Grade ll*. Also that year came the news that Camborne Methodist Circuit have no choice but to sell it. At a dramatic auction, a paper bid came in from Scotland from someone who wanted to convert it into a craft centre, and this pushed the price higher than expected. Professor Charles Thomas and members of his family stepped in and saved the day, and a trust was set up to run it. In 2008, the Chapel was renovated with grants from English Heritage and Sita helping to fund the project. There are occasional Sunday services in the summer months for up to 80 people. Inside consists of a small gallery and organ, and a display of photos and literature on the history of the building. The Chapel is open daily at all times, from Easter - first week in Oct.
After 200 years, Gwithian Chapel continues to play an important role in the village. From the notice board - the date of the Chapel = ABAC. At the door - There are two glass panels, but how many wood panels = D.
And how many screws hold the door handle on = E.
Cache can be found at - N50'13.D(B-E)(A+F). W005'22.(D+E)(B+C)(A+E). Thank you to Gwinear and Gwithian Parish Council for granting permission to place this cache on their Nature Reserve.